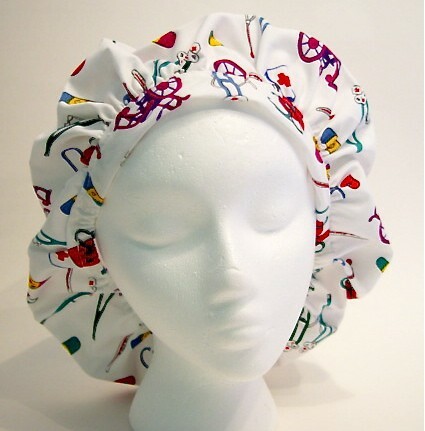 Light weight and comfort are the Rx for the day with these custom made surgical scrub hats. The bouffant style allows enough room for even the LONGEST ponytail! Made from cotton fabric. Flat band across forehead with elastic in the back. One size fits most but if you need a smaller or larger puff please let me know. A friend of mine is a labor and delivery nurse at a local hospital. When I made my first one for her she was sooo thankful that she finally had a scrub hat that was not too tight on her head and ears. To customize the fit you can move the gathered fabric that rests on the ears. To straightened it, simply push the gathers closer to the back of your neck so what rests across your ears is flat.